Out of the Attic and into view. What was old, becomes brand new. A touch of whimsy, a bit of romance, because some things deserve a second chance. Why Out of the Attic? Years ago, when we met, we quickly developed a love of garage-saleing together, and and our Saturday morning "saleing" sprees became tradition. We kept finding such cool stuff - stuff we couldn't use necessarily, but lovely and unique old objects we just couldn't pass up. The potential was there! So we started a small craft business called "Out of the Attic". We really should have called it "Out of the Garage," but that just really wasn't the feel we were going for. We had so much fun creating together out of old linens, silverware, dishes, jewelry, and anything lovely and loved. Back then we had only 6 children between us, now we have eleven total (9 boys)! Our "Out of the Attic" business slipped into oblivion during a pregnancy or two (or five). Life is somewhat more complex for both of us now. We have children of many ages (2-13) and stages (toddler - middle school) who seem to be involved in everything and need to be everywhere (we both try to limit the activities, but with so many kids there is always something on the schedule). We have commitments in our community and huge jobs at church. (Rachelle is the young women's president and Alysa is the primary president. If you're not familiar with LDS lingo, those jobs can be summarized in 3 words - BUSY, BUSY, BUSY!) We are also lucky enough to have good husbands who still like us and want us around. But as busy as we are, that need to create still burns in both of us, now more than ever. Coincidentally, we are both just coming out of our own family crises where caring for a sick family member meant months of stress, exhaustion, and just making it through each day. There is little room for creativity in crisis living, and we both felt the lack keenly. Now that both of our families' lives are slipping back into normalcy (the Lord is so good! ), we are both just aching for a creative outlet and an excuse to start digging in the dusty old attics of our minds again. This blog is it! Though we are alike in many ways - we look alike (blonde, more than 5'9" tall, motherly gut) and love many of the same things (anything old and loved, our families, the Lord, vintage tablecloths, etc), we also have somewhat different tastes and talents Let us take turns describing ourselves and each other. Rachelle: I am a total right brained artistic, often out-of-control-creative type who can get a vision, and figure out just how to make it a reality. I loves stamping, watercolor, decorating, and am just starting to delve into digital photography. Alysa balances me out and grounds me, because she has more of a developed practical left brain (mine is shriveled and dry I think.) She loves to create too, and has a divining rod for finding great and easy ideas and putting them to practical (and pretty) use. Her family is everything to her, and she is always coming up with new ways to organize and make family life run smoother, and fun, meaningful activities to do with her children. Beyond that, she is a genius with people, and a friend to all. Everybody loves Alysa, and I am proud to claim her as my partner in creative crime. There is no face I'd rather see every Saturday morning at 6 am than hers. Alysa: I am practical and simple in many ways. I like activities and decorations to have meaning and purpose. I enjoy teaching, organizing, paying someone else to do a project, garage saleing, and purchasing items for a project but choosing family and friends over actually doing it. (Hopefully via this blog I'll be inspired to actual accomplish some of those projects.) What a treat it is for me to embark on another creative adventure with Rachelle! She really brings out my creative side -- a side that is underdeveloped and in need of some serious working out. Besides being beautiful and talented, Rachelle is very patient with me! I do things more simply (and sometimes boring) and she does things with such detail. She adds those finishing touches that turn something from plain to simply fabulous. She seriously can do anything and everything she puts her mind to doing. I'm always in awe. I'm privileged to know Rachelle and have her add many finishing touches to my life and now to yours. We have always loved sharing creative ideas (our own and those we stumble upon) with each other, and now we want to share some of them with you! So dust off that old trunk under the dormer and start digging "out of the attic" of your minds with us! * and anything else we might dig out of that dusty old trunk under the dormer. 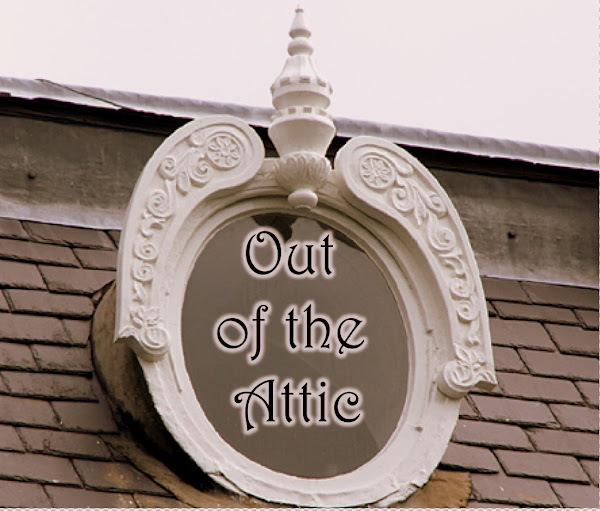 Click here to find out who the Attic Gals are and what we're doing digging around up here. Come, attic diggers, to our Etsy Shop (click santa spoon above), and see what treasures you can discover there! julie parker photography......delight in the little things!